Tired of having to remember how many cubicles in from the edge of the cluster yours is? Give your space some flair with this great weekend project from This Old House. In architectural terms, the cubicle is the tract home of today's cookie-cutter office complex. So if you're still plugging away in a Dwight Schrute special as you await that big promotion to senior associate something-or-other, why not live the dream by dignifying it with some classic architectural lift? Doing so might cause Mr. Corner Office over there to wonder what the young go-getter in the Colonial Revival cubicle is all about. Keep clicking as our own working-cube hero, Senior Technical Editor Mark Powers, shows you how to dress your polyester-lined pad for success. Step 1. Build the roof. First off, tell your officemates to plug in their ear-buds and crank up the Pandora. You've got a major construction project under way. Start by assembling a 6/12 pitch roof over your cube using 1x4 rafters, spaced 16 inches on center. Brace it with collar ties, then sheathe it with ¼-inch plywood fastened with 8d ring-shank nails. Once you're done you'll never again have to worry about colleagues peering in horror over your shoulder as you wolf down one of those KFC meat sandwiches while catching The Biggest Loser on Hulu. Step 2. Install the door. Ever wish you could make like Don Draper and enjoy bourbon-basted closed-door meetings in your very own office? That's a tough task when you don't even have a door. To install one, slide the frame of a pre-hung door into your cubicle opening. Shim as necessary to square, then screw it in place. Cope the saddle so it fits snug with the jam profile, and install the base of the door opening. Mortise the casing and door for the hinges, screw on the hinge plates, and attach the door. Cocktails anyone? Step 3. Create a surround. Take down those push-pinned pictures from your post-college trip to Amsterdam, and toss that flyer from the Strokes-inspired band you once fronted in the recycling bin. You're all grown up-and it's time your workspace reflected it. 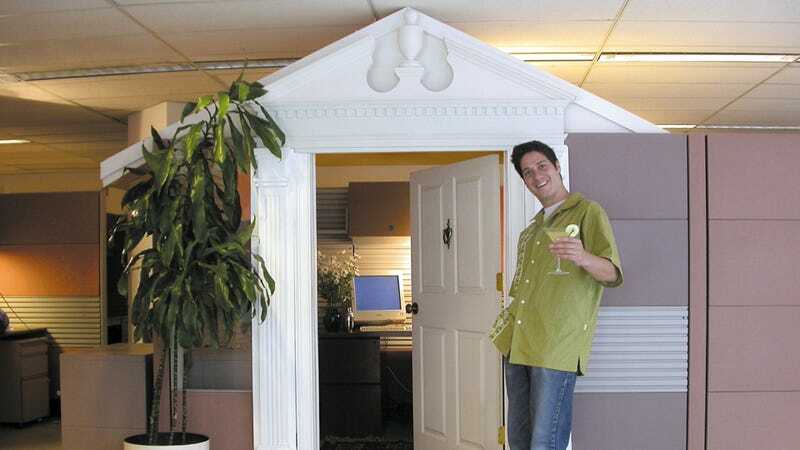 Nothing screams "I mean business" like fluted pilasters flanking your cubicle's entryway. After gluing and toe-nailing the pilasters into place, attach a strip of molding to cover the gap between the pilasters and the door jamb. This one has an S-shaped (ogee) profile that'll give your cube that traditional feel you've been looking for. Easy - moderate; You'll need to do some noisy construction without incurring the boss's wrath. Step 4. Add a pediment. Topping off such man-made masterpieces as the Parthenon in Athens, and the Pantheon in Rome, a pediment is a great way to turn a common cube into something that screams "I Am Middle Management, Hear Me Roar." Position the pediment so the return on the entablature conforms to classical proportions. Once you finish the job, stand before your own masterpiece and scream, "Look on my works ye Mighty, and despair!" Even those officemates who aren't familiar with Shelley's 19th-century poetry will get the picture. So, how's it feel to be working in the best-looking cube on the block? Pretty good, we're guessing. Pretty. Darn. Good. And, oh yeah, happy April Fools' Day. Did we lose you at "6/12 pitch roof?" Check out the Full Article here for more info and explanatory photos. Need more inspiration for overhauling your personal workspace? Take a look at other TOH projects to have graced Gizmodo, Bringing Down the House: The Search for America's Funniest Contractor, The World's Wildest Houses, and The World's Most Expensive Home Products.